Axis Towers will offer its customers a wide range of options for recreation and entertainment. 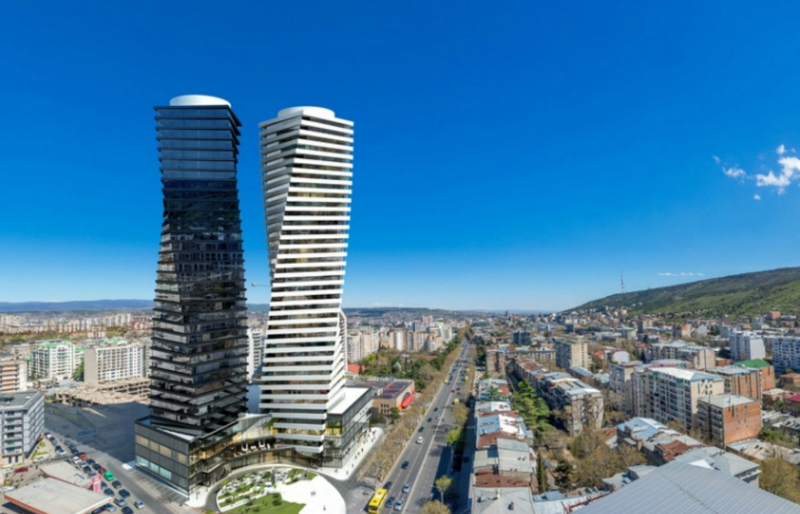 The skyscrapers will include several facilities such as: a fitness and spa centre; a 25-meter long swimming pool with a sliding roof; a Sky Bar on the top of the towers with panoramic views of Tbilisi; a 1,100 m² concert hall; a shopping mall, several restaurants and cafes. The Axis Towers project will feature an underground car park area with capacity for 500 vehicles. As part of the project, a new street connecting Chavchavadze Avenue and Abuladze Street will also be developed which will house a recreation area with a number of cafes and restaurants. This will improve pedestrian access in Tbilisi and the street will become a place where residents and tourists can gather and meet. The General Director of AXIS, Giorgi Kapanadze, says: “Axis Towers s an unprecedented project in terms of its scale and functionality. This is a multi-functional complex which includes five directions of development as the skyscrapers will house high-level residential, office, commercial and entertainment areas as well as a 5-star Pullman hotel. AXIS continues to play an important role in advancing Georgia’s industrial development and we are especially proud that Axis Towers will be the new landmark of Tbilisi. The project was renewed in cooperation with the Georgian Co-Investment Fund and is progressing actively. I am pleased to announce that residential areas at Axis Towers go on sale today. CEO of GCF, George Bachiashvili, says: “The Axis Towers project is fully in accordance with the mission that the Georgian Co-Investment Fund seeks to fulfill. By implementing this project with AXIS we are investing US$83 M in Georgia’s economy. At the same time, we are supporting the further development of an already successful Georgian company, AXIS. We are also utilising the expertise of the international industrial leaders through our work on this project and creating a range of new local jobs. “We are glad that the Georgian Co-Investment Fund played a crucial role in making this project happen: with ours and AXIS’ efforts several months ago, we were able to renew a project that had stalled for 7 years. Now, the project is expected to be completed in 2017.